I will be the first to admit that good music existed before I realized there was such a thing as music. The fifties were before my time, but so were the forties, and I am a big band fan. I missed the roots of rock 'n roll -- my sisters experienced it. Chuck Berry, Buddy Holly, Little Richard...Fats Domino. Little kids have weird fears. Low voices scared me. I remember my Mom and Dad had a '45 record recorded by Lawrence Welk's band (they were big Welk fans) -- I think it was called "Grandfather's Clock". The singer had a deep bass voice -- scared me to death. His voice reminded me of that man who hid behind the tree at night when I had to run out to the little house in back to go to the bathroom. (Oh yes, there was a man who hid out there, just waiting to grab little girls). I was a flower girl in my cousin's wedding when I was three years old. My cousin's fiance scared me to death. He had big bushy eyebrows. When I would be over at my cousin's apartment and her fiance walked through the door, I would stare in horror at those eyebrows, afraid to take my eyes off them for fear they would attack me. And by the way, making a little kid be a flower girl sounds like a cute idea. She's essentially there as entertainment for the adults. "Ahh, isn't she cute? Oh look! She turned around and walked the wrong way down the aisle! Now she's plopped herself down on the altar steps! So sweet!" Well, guess what? A three-year-old has no earthly idea what she's doing there and why exactly she's being made to perform. I initially bought into the idea of being a flower girl, because I liked flowers. Unfortunately, the experience didn't live up to its hype. I don't recommend it. And then you have the requisite photo session after the wedding, when you're cranky and all you want to do is take a nap. And Mom's no help, because she's just praying you don't embarrass her. Mom refuses to even claim you as her own. This is a roundabout way of saying that Fats Domino's voice scared the little kid that was me. The last time I gave a thought to Fats Domino was during Hurricane Katrina, when newscasters announced that he was "missing". I thought, oh, that poor old man. He was later found and all was well. At some point, a bunch of artists got together and recorded a tribute album and I bought it. It introduced me, or reintroduced me, to some great songs. And I was no longer scared. Of course, I was older by then, no longer afraid of bushy eyebrows and men laying in wait behind trees. 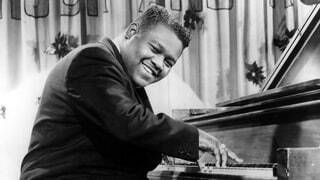 I believe Fats Domino was a humble man who stayed true to his roots. And he made some awesome, pioneering music. I'm glad I finally caught up with it.